Something tells me the peasants are not took keen on my style of leadership. The latest opinion poll says they hate me. Must be something to do with the war, famine, disease and my — sorry — our country's rather healthy bank balance. Still the United Nations seems pretty keen on me. They reckon I'm a good leader. That makes a change from the accusations of tyranny they were throwing at me last year. With just one month to go before (face the electorate with my main opposition party sitting rather comfortably on a 96 per cent lead in the polls, I somehow get the feeling I won't be enjoying a second term of office. Sent into a exile at an early age. 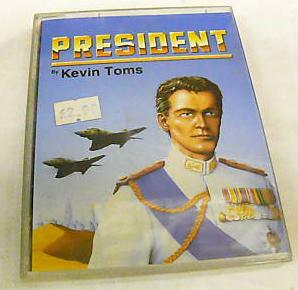 Well power is the name of the game in Kevin "Football Manager" Toms'latest offering, coping with economic survival, defence, health, famine and getting votes. It's been a long time coming as well. It was originally meant to see the light of day around the time of the PCW Show back in September. President is an update of all those "run your own country games" such as Kingdom and Dictator which were around about five years ago. The President, however, is a lot slicker. The setting is an unknown country, possibly Middle Eastern judging from the amount of oil sand and tanks around the place. You have an initial choice of whether you want your country to be poor, of medium wealth or filthy rich. The term of your presidency before facing the electorate is two years or 24 complete moves of the game. The monthly duties involve oil exploration and development, planning for and fighting off attacks by hostile countries, food production, looking after the health of the nation, finding and fulfilling contracts from other countries to supply oil, wheeling and dealing on the gold and currency markets. It's really like a complicated juggling act. And at the same time you've got to keep an eye on what your people think. Policies which you may be convinced will benefit your country may tend to be incredibly unpopular. Strategy is everything in this game. The graphics and sound are really worth mentioning. football team it may well be worth your while stepping up in the power stakes. My own tastes are for something a little more exciting.